We’d love your help. Let us know what’s wrong with this preview of Analog Science Fiction and Fact, December, 2016 by Trevor Quachri. SISTER: LOKI - Arlan Andrews, Sr. THE NEW SPACE RACE - Christopher MacLeod, PhD. To ask other readers questions about Analog Science Fiction and Fact, December, 2016, please sign up. I thought this was a great issue. Favorite stories: Gord Sellar's "Prodigal", "Jewells from the sky", "Crowdfinding". I also loved "Black orbit" for the structure and inventiveness. This is the final issue of "Analog" - As a monthly title. Starting next month, with the January/February 2017 issue, "Analog", like "The Magazine of Fantasy & Science Fiction", becomes a bi-monthly title. And rather than go out with a bang, the final monthly issue is a mixed bag of stories, but overall, a fairly decent edition. Story highlights are the cover novella, "Prodigal" by Gord Sellar, "Crowdfinding" by Eric James Stone (which isn't too far-fetched technologically. Really, that story This is the final issue of "Analog" - As a monthly title. Starting next month, with the January/February 2017 issue, "Analog", like "The Magazine of Fantasy & Science Fiction", becomes a bi-monthly title. And rather than go out with a bang, the final monthly issue is a mixed bag of stories, but overall, a fairly decent edition. 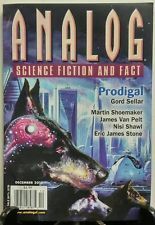 Story highlights are the cover novella, "Prodigal" by Gord Sellar, "Crowdfinding" by Eric James Stone (which isn't too far-fetched technologically. Really, that story could almost happen today.) and "Black Orbit" by Martin L. Shoemaker. Robert Scherrer's "Fermi Meets Sagan" was a cute little tale. I liked it well enough, while Brendan DuBois' "Jewels From the Sky" was fine, but I'm not sure I buy the ending of it. That seems to involve too many skill sets for Amy to have. I wanted to like Nisi Shawl's "Like the Deadly Hands" more than I did, but it felt a bit disjointed to me. I also wanted to like "In Boonker's Room" (Eliot Fintushel's entry) more. Both stories seemed to be aiming for deeper meanings and I'm not sure I got what the authors were aiming for. James C. Glass' "Evolution" was also a bit on the philosophical side, but it worked better I thought. "Sister: Loki" by Arlan Andrews, Sr. was good, but nothing special to me and I generally do like his work in the pages of "Analog". As for James Van Pelt's "The Continuing Saga of Tom Corbett: Space Cadet"? I'm not sure it really qualifies as science fiction. Maybe sf of "The Twilight Zone" type. It's well told and all, but it could easily be published in a non-genre book or magazine and fit there just as well in "Analog". Good+. A childless couple have Benji sentientized (increased mental capacity and vocal changes so they can talk). They love their dog and we follow them along. They miraculously have a baby and start explaining things to Benji. Then there are external influences--TV shows for dogs, other sentietized dogs. I tried to read this vicariously and was a bit put off because it wasn't what I'd do. When I put more distance between me and the characters then enjoy the story more. OK/meh. Carpenter Marie has been a prisoner aboard a ship. She is now going to be downloaded into the body of a trustee and sent to the settlement of Jubilee. Wayna is a prisoner already in Jubilee. We hear and then find out that life on planet is dangerous, but the plans and motives of Wayna and Carpenter Marie are never given. We have no background on these people. OK/good. A race of genocidal aliens picks up communications from Earth. Good+. Amy is working for a salvage company that brings down satallites and retrieves them when they come to earth. We find she was originally with a group that got to the downed satallites first. On their last raid the company caught them and kidnapped her into working for them in space. OK. E.W. Boonker shows Saul a game. A box that can show the universe anywhere from the big bang onward with a zoom level from quarks to everything. A lot of talk of cosmological constants and forces. Good/OK. Tobi starts out as a household cleaning controller, on to a math tutor program, and over hundreds of years evolves. Fair/poor. Loki lives in a war torn society. She is a mercOp linking remotely to her skel. A decent job of world building, but we only follow Loki through one day. Very Good+. A drone operator catches a kidnapping as it's taking place. Many other citizens get involved in finding the boy. Then there is a second crime for which the first may have been a diversion. Good mystery element set in a not too distant future that is slightly more connected. Excellent. Tomika is teased by her grandfather because she has the same name as a fictional hero. When she is old enough she reads some of these stories and takes the nickname to heart. She applies herself dreaming of the time when she can join the Space Academy. There were a lot of short stories in this issue, which is a pretty average one. Dogs are being augmented for sentience and greater intelligence. A childless family gets a smart dog, but the wife gets pregnant soon after. The dog and the child first live as “siblings”, but then the dog starts to question certain things – like killing of the dogs in shelters. A fairly good story – the writing was okay. The radicalization of the dog was not portrayed well enough. There were a lot of short stories in this issue, which is a pretty average one. Sister Loki • shortstory by Arlan Andrews, Sr.